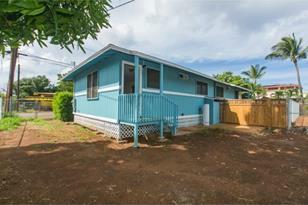 Completely Re-finished Duplex, 2 bed, 1 bath unit, just steps from the ocean! All New kitchen and bath cabinetry, all white with beautiful granite counter top, stainless steel appliances, ALL fresh with new vanity, bathtub, new roof, sidings, plumbing, electrical and floors. Or you can get both duplex, live in one and rent the other. Project has been just approved for VA loansl. Nice Large land with room to grow! Priced like a condo with beautiful land space to call your own and no maintenance fees! Sold by Marcus & Associates, Inc.
84-1026 Hana Street #4, Waianae, HI 96792 (MLS# 201502640) is a Single Family property that was sold at $250,000 on June 15, 2015. Want to learn more about 84-1026 Hana Street #4? Do you have questions about finding other Single Family real estate for sale in Makaha? You can browse all Makaha real estate or contact a Coldwell Banker agent to request more information.